The Bruckner Gesamtausgabe (Brucker's Complete Edition) is a critical edition of the works of Anton Bruckner. Published by Musikwissenschaftlicher Verlag Wien [de] in Vienna, it comprises three successive editions. This first edition (12 volumes issued) included 'hybrid' scores for Symphonies Nos. 2 and 8 and other similar conflations for some other revised works (Mass No. 3). In this new edition Nowak et al. went about publishing several versions of some works, in the process correcting some mistakes of Haas. From 1990 onwards (Editorial Head: Herbert Vogg), William Carragan, Paul Hawkshaw, Benjamin-Gunnar Cohrs et al. were in the process of reviewing and further correcting the work of Haas and Nowak. In 2011 it has been decided to issue a new edition, which will include the content of the current edition and integrate the in the meantime retrieved sources. 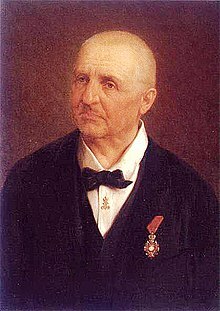 ^ "Anton Bruckner (1824–1896) – Kritische Gesamtausgabe". MWV. Retrieved 28 October 2017.